Recently, a reader asked for advice on how to effectively execute the planning phase of an implementation, especially when leaders, sponsors, or team members want to skip it and just start doing stuff already! Here's the trick. If you do too little planning, you’ll waste a lot of time and tempt failure. However, research also shows if you do too much planning you'll waste a lot of time and tempt failure. How do you get it 'just right'? Think of the story of Goldilocks. She tries all the bears' porridge and sleeps in all their beds searching for 'just right' and ends up enraging the bears and running for her life. Don't do that. Instead, try out some of the suggestions in this three-part post on planning. 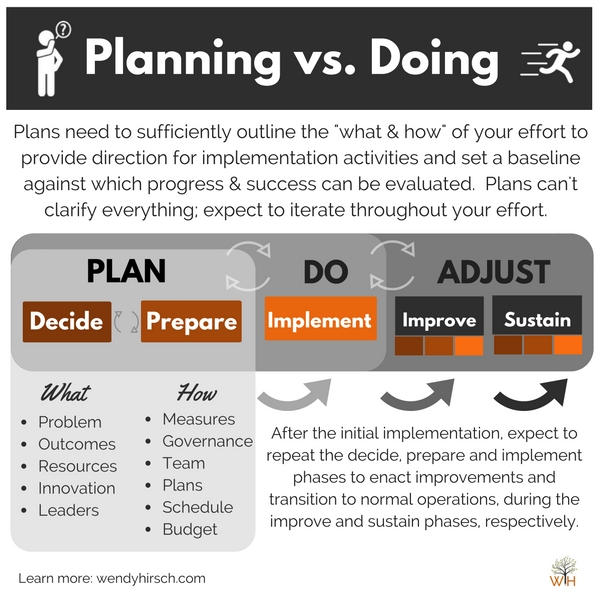 In Part I, below, I discuss the purpose of planning, review research findings on the relationship between planning duration and implementation success, and provide a simple method that may increase support for planning on your team. Ask yourself: What is the value of planning? I suggest a five-phase implementation approach in my book. However, there are many other phase models. Use what best suits you, but use it consistently! Let's start by returning to my reader’s question. I interpret it, at least partially, as a call for help in convincing other people – sponsor, team – that planning is important. I’ll get to that in a bit. But first, let’s talk about you. As a project manager or implementation lead, you need to have a detailed and grounded understanding of the purpose of planning. Not just a conceptual notion of it, but a thorough grasp of what planning provides to your effort. If you do, you won't skip it, no matter who pressures you to do so. What problem or opportunity we want to address. What innovation or "solution" we'll use to address it. What we want to achieve by doing it. Who has a say in what (and who doesn't). What resources we, as an organization, are willing to invest in the effort (time, money, people). How we will organize ourselves to solve this problem or capitalize on this opportunity. Everyone involved needs to understand these things to effectively contribute to the execution phase of the implementation. Shared understanding about these topics doesn't just happen. It takes time, dialog, disagreement, reflection, research and finally, agreement. Planning encompasses all of these things. You can either address them purposefully through explicit planning or take the Goldilocks approach...and you remember what happened to her. This doesn't mean you should aim for perfection in planning (see more below). Iteration on plans should happen throughout the effort — you'll learn, you'll adjust. However, you'll operate from a more stable position if you explicitly focus on building a strong foundation of shared understanding at the outset of your effort. Ask the academics: How much planning do we need to do? It would be pretty convenient if someone would just tell us how much planning is 'just right'. But, as you may have guessed, the answer to that question is, "It depends." Still, research from the field of project management can provide some insights to help you answer this question for your project. I found research based on a case study, a global survey, and a high-level meta-analysis that suggests you can do too little planning, but also that you can do too much. Specifically, these studies found variants of a U-shaped relationship between planning duration/effort and indicators of project success (Choo, 2014; Serrador, 2015) (1). References: Choo, 2014; Serrador, 2015. One reason that 'more may not always be better' relates to the quality of planning undertaken. You can spend a long time on something and still do a lousy job of it. In their study, Serrador and Turner found several factors of planning quality to be associated with project success, including quality of the work breakdown structure, quality of the project goals/vision, and level of stakeholder engagement (2015). Second, several studies found that a prolonged planning period can signal a problem project (Serrador, 2015) — for example, a project with a high degree of risk or complexity, or for which support or leadership is shaky. Finally, sustained planning can also just be overwhelming. The team can get lost in a flood of information, which hampers their ability to set priorities and make clear decisions (Choo, 2014). Putting the question of quality aside, the research I reviewed does suggest an optimal planning duration. Given the limitations of these studies (2), I recommend thinking of this as a best-guess to be used in conjunction with other factors (see below) when developing your planning approach. It's not a proven rule or a magic number. These studies suggest that the sweet spot for planning duration is somewhere between 20-30% of overall project duration (Choo 2014, Serrador 2015). Other factors can impact how much planning is ideal for a given project. Several studies suggest that the experience level of the team, project manager or organization can impact the optimal degree of planning for a project. The more experience, the better the collective ability of the team to accurately assess what is needed (Choo, 2014, Serrador 2015). The findings on the relationship between project complexity and planning duration are themselves complex. In short, making accurate choices about planning methods that help to break down and simplify a complex project is key to avoiding further complication of the effort through planning (Choo, 2014). Ask your team: What parts of planning can we do without? Most teams and sponsors want the clarity created by quality planning, but, as noted in my reader's question, may not (initially) want to invest the time or energy necessary to achieve it. How might you convince a skeptical team that planning is worth the effort? Try having them co-create the planning process with you, starting with a simple question. Ask your team, ideally including your sponsor, which of the common outputs of planning they think are not necessary in order to proceed and why. Which of these can we do without? Why? Scope: What are we doing and what are we not doing? Objectives: Why are we doing this? What do we want to achieve? What’s most important/not important to this project? Norms: How will we work together? How will we communicate? How will we make decisions? Challenges: What are potential roadblocks to success, or concerns of the team and/or leadership? In discussing their answers to the question, the team will develop an understanding of how the outputs of planning are used by different team members and who they provide value to (if it's not everyone.) It's also likely that through this exercise the team will uncover what is already known and agreed to and where differing opinions need to be worked through. Further, it's often the case that such discussion will help identify blindspots — important topics that may have been previously overlooked. Once an agreement is achieved on key components of planning for the project in question, the team can jointly estimate the overall time investment necessary for planning and who should be involved in which aspects of it. This approach may feel risky because you are giving up some control as the project manager. But it has its rewards. You'll probably find that, as a whole, the group will recognize the value of the truly necessary components of planning. With this approach, the team will also have a hand in crafting the planning agenda, rather than having it dictated to them. They may even come up with a novel approach you didn't think of! Further, you may find the team becomesmore supportive of the planning effort; people tend to be more supportive when something is their idea. To sum up, when developing your planning approach, it's wise to consider a variety of factors. Take into account your level of experience as well as your team's, the novelty of the project in the organization, and the current degree of uncertainty about the project. It's also important to keep an eye on the quality of what you are producing during planning. Finally, if you get early signals that your team or sponsor is not a fan of planning, it may be a good idea to get them to help you co-create the planning process you'll use on the project. Want to learn more? Check out Part II of this three-part series here, where I offer ideas on how we can use research on the problem-solving practices of experts to inform our planning practices. Not really interested in planning? Drop me a line about what implementation topics you are most interested in! I regularly use reader questions to inform the content of future posts. Project success was defined differently in these studies. 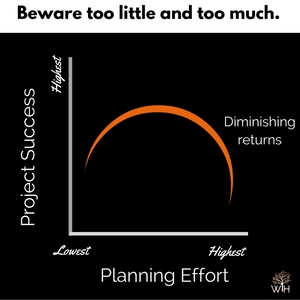 Choo looked at overall project duration as a measure of success and found that both too little and too much planning extended project duration. Serrador and Turner looked at the impact of planning effort on both efficiency and (perceptions) of effectiveness. The research methodology used in these studies does not support conclusions about causal relationships, i.e., we can't say from these studies that planning causes project success or failure. Choo used data from 1600+ Six Sigma projects in one IT firm. Serrador and Turner used data from a global survey, completed by 800+ project managers, in 60 countries, and related to 1300+ projects. Serrador and Turner also included in their paper findings from a literature review and high-level meta-analysis of quantitative data from 8 studies. Choo, Adrian S. "Defining Problems Fast and Slow: The U-shaped Effect of Problem Definition Time on Project Duration." Production and Operations Management 23.8 (2014): 1462-479. Web. See here. Serrador, Pedro, and Rodney Turner. "What Is Enough Planning? Results From a Global Quantitative Study." IEEE Transactions on Engineering Management IEEE 62.4 (2015): 462-74. Web. See here.